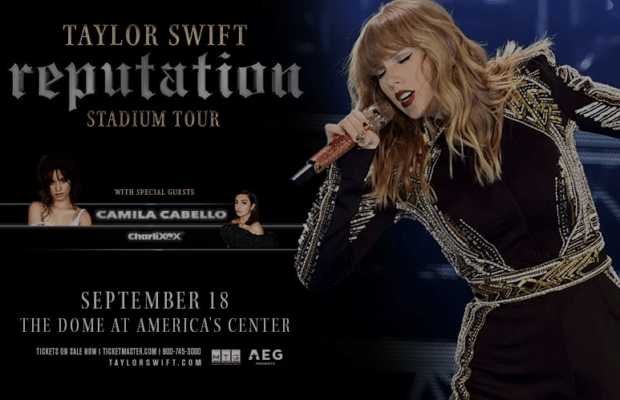 Pop superstar Taylor Swift is bringing her hugely successful Reputation Stadium Tour to Saint Louis at the Dome at America’s Center on Tuesday, September 18 and it’s proving to be one of the hottest tickets in town. Surprisingly, a handful of good tickets are still available and can be purchased at tiketmaster.com at the link above. Some tickets available are on the floor a few rows from the stage for $250 each. If you don’t want to spend that much there are a spattering of tickets in various sections for much cheaper. It just depends how close you want to be to Taylor. You better act fast or you may get shut out. The 7:00 PM concert will also feature Charli XCX and Camila Cabello, both of which have a large following themselves. So, you should get your money’s worth, that is for sure.